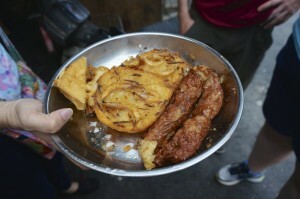 Today got off to a bit of a disjointed start – I’d managed to conflate our food tour with our cooking class. The latter starts at 9am and is on Monday, the former started at 5pm and was today. I had convinced myself that the food tour started at 9am today. Luckily, I realized the mistake around 8:15 this morning, only screwing up a chance to sleep in a bit, but nothing more. Instead, we left the house in an unstressed manner, and found some roti canai, this time stuffed with onions. As an aside, we’ve just learned that, in spite of seeming like a relatively light breakfast, roti canai, being fried in ghee, is rather terrible for your ability to stay alive. Meh. Shortly after our roti, we ran into a street fair. We’re actually not sure what this one was celebrating – there’s a confluence of related but independent events going on right now. There’s the month long Georgetown festival, the Malaysian independence day, and a month long Chinese holiday. This particular event may have been related to the latter, as it seemed like it was primarily Chinese-Malaysians in attendance. Regardless, there were people dancing in the streets, booths with things we didn’t need to purchase, and a whole street of games from the Gohkaki Childhood Musuem. The idea was to introduce kids to all the games they don’t play anymore – hop scotch, finger paint, duck duck goose (not grey duck), etc. It was kind of awesome. There was also free cotton candy. 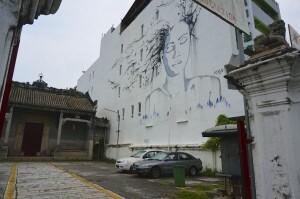 We kept wandering, with a loop past Fort Cornwallis and up to the Penang State Museum. The museum does a nice job of explaining the history of the island, and breaking out all the different ethnic groups. We learned a lot that helped us understand some of the different social divisions we’d observed. Also, the museum was only 1 ringgit (25 cents) to enter, which is the bargain of the century. As we left the museum, it was raining a bit and we were feeling pretty lethargic. We stopped into Wheelers Cafe for a coffee and a snack. Right about the time we got inside, the skies opened with a torrential downpour – luck was on our side. 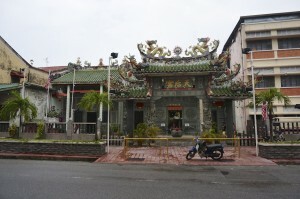 By the time we were ready to leave, the rain was done, so we walked around the corner to the Hainan Temple. On the way there, we made an unexpected discovery – the Purrfect Cat Cafe. For those that are unfamiliar, a Cat Cafe is a cafe full of cats. You go in, the cats mostly ignore you, then you leave. As you might expect, these are big in Japan (where there are also rabbit cafes, goat cafes, etc). Unfortunately, the cat cafe was too full to take us, but assured us that if we came back in a little bit, we could come in. We got some smoked pork rice for lunch, poked down some alleys and sought out some street art for a bit, then circled back to the cafe. And lo, there was space. And lo, we went inside. And lo, there were cats. As cats go, these were very nice cats. They ignored us. We took pictures of them. Everyone squee’d. Suitable cat’d, we set our sights on the clan jetties, which are, as the name implies, jetties that are divided by Chinese clan. They’re still inhabited – which is pretty amazing when you look a little more closely at how they’re held together. Nature is not on the side of the clan jetties. On our way back towards the apartment, we hit the next street fair of the day. 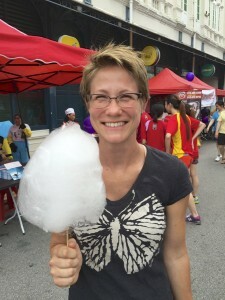 This one was part of All Things Malaysian which was a subcomponent of Georgetown festival. Whew. More booths, more food, more music, with its epicenter on our street. Awesome! We picked up a comic book by a local artist that illustrates a 7 day tour of the region. We also bought a book from a group called “My Date is a Book.” In an effort to keep you from judging a book by its cover, they had a table full of books wrapped in brown paper. 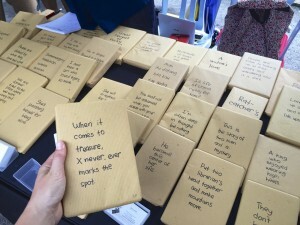 Instead of a title, each book was labeled with a quote from the book. We bought a booked labeled “X never ever marks the spot,” remembering the quote from Indiana Jones and the Last Crusade. It ended up being a neat copy of Treasure Island, which I’ve never read. Score. By this point, it was actually time for our food tour. We went to the meetup spot and met our guide, along with the other people who would be joining us. Two coworkers from Houston, working in Malaysia on a petrochemical project, along with Pakistani writer/PR person who lives in Hong Kong, in town to cover Georgetown Festival. We got in the van and set out for the tour. We’re going to try to document the tour, for our own memories, but things got a little hazy as the gluttony really kicked in. 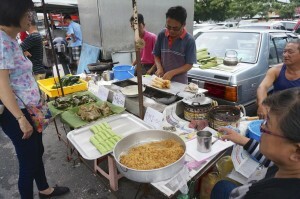 Our first stop was for some Assam Laksa and green-noodley-dessert-stuff, which almost certainly has an actual name. 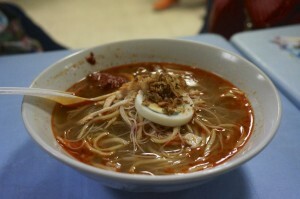 The laksa was different from the stuff we had yesterday – less fishy, more fruity. 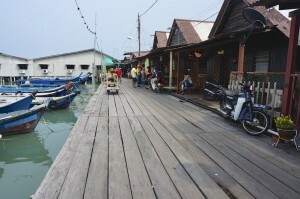 From there, we went down to another clan jetty (not one we’d visited) and had prawn fritters, fried tofu, and some sort of fried pork skin roll. 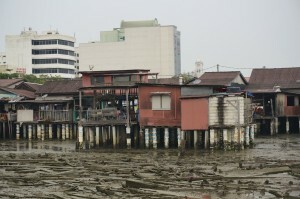 The tide had gone out, which meant we could see all the muck under the jetties – sunken boats and all. Next, we went to a housing project – a series of identical, Soviet-esq (or Cabrini-Green-esq, take your pick) towers, which act as self contained towns (doctors, schools, etc). 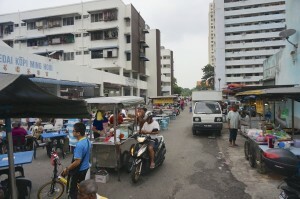 The parking lot between the towers becomes a home for food stalls in the evening. 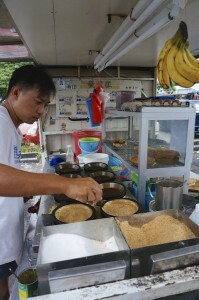 We had some sort of fried dough with corn and peanuts, glutinous rice balls with shredded prawn, and an Indian pancake. 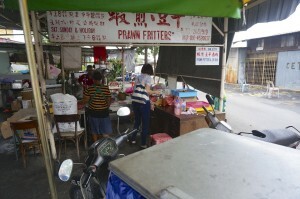 Next up was New Lane, a famous hawker market. Here’s where things went into overdrive. 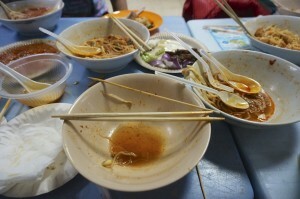 We had hokkien mee, curry mee, char kway teow, pork satay, and some sort of steamed fish cake. 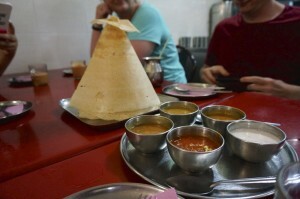 Then it was off to a vegetarian Indian place for roti with … something … inside, along with a small volcano of thin fried dough. The idea was to tear off bits and cover it in various curries. 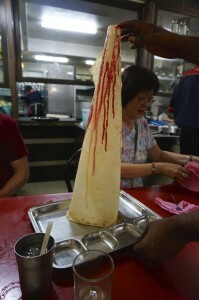 Feeling near death, the next round arrived – the much larger volcano of dough, covered in sweetened condensed milk. Things wrapped up from there, and we walked back towards our apartment. We detoured to explore the street fair a bit more, exploring some galleries and listening to some of the musical performers. So, a pretty packed day, all things considered. I’m gasping! What a day. Thanks for the explanation of cat cafes — bad for people with cat allergies. Don’t know how you keep track of all the foods but it’s fun to hear about them and see pictures. The volcanoes are really interesting. I also loved the description of the bookstore — so happy you got a copy of Treasure Island! What a cool idea — maybe we should try that at the AAUW book sale.